A clinical pregnancy is a pregnancy that is confirmed by both high levels of hCG (the pregnancy hormone) and ultrasound confirmation of a gestational sac or heartbeat (fetal pole). Detecting a fetal heartbeat with a handheld Doppler or a fetoscope also clinically confirms a pregnancy. 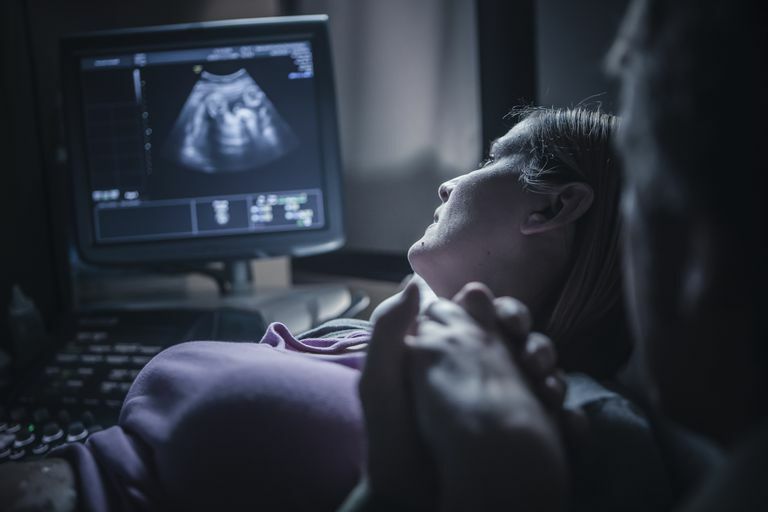 Sometimes, a pregnancy ends in miscarriage before ultrasound confirmation can take place. This may be referred to as a chemical pregnancy. Understanding the definitions and difference between a chemical pregnancy, a clinical pregnancy, and pregnancy symptoms can be confusing. Let's explore each, one by one. Pregnancy symptoms are things you experience or feel when pregnant. This would include fatigue, tender breasts, or nausea (morning sickness. However, pregnancy can’t be confirmed by symptoms. So-called “pregnancy symptoms” can be caused by illness, stress, and even regular premenstrual symptoms. It’s also possible to be pregnant and have no early symptoms. The only noticeable sign may be your late period. The term chemical pregnancy means the pregnancy has only been detected via chemical means. In other words, the pregnancy hormone hCG (which is a biological chemical) is detectable. Pregnancy may be detected chemically two weeks after conception. This would be considered four weeks pregnant. The term clinical pregnancy means there are clinical signs of a fetus. Clinical signs are ones that can be seen or heard. This is unlike pregnancy hormones, which you can’t see unless you have an electron microscope. The earliest clinical signs of pregnancy are detectable at about 5 weeks pregnant, or one week after your period is late. The gestational sac is the beginnings of what will become the amniotic sac. It’s a fluid-filled cavity, inside which the embryo lays. The embryo is very tiny at this point and is not clearly visualized on an ultrasound. The gestational sac can be seen via transvaginal ultrasound one week after your period is late. You would be considered 5 weeks pregnant at this time. The yolk sac is the first visually detected structure within the gestational sac. It provides the early embryo with nourishment. It can be seen via transvaginal ultrasound at around 6 weeks pregnant, which would be two weeks after your period is late. An abnormally sized yolk sac – either larger than normal or smaller than normal – may indicate a problem. Your doctor may closely monitor the pregnancy in this case. The fetal pole is the very first visual evidence on ultrasound of a developing fetus. It is seen on an ultrasound as a “thicker” area attached to the yolk sac. The ultrasound technician can usually see the fetal pole at around 6.5 weeks pregnant, or two and a half weeks after your period is late. The earliest sign of a fetal heartbeat can be seen via a transvaginal ultrasound. At the earliest, a fetal heartbeat may be seen around 6.5 or 7 weeks. A strong heartbeat at 7 weeks is associated with a significant decrease in miscarriage risk. If a heartbeat isn’t seen, your doctor may order another ultrasound for a week later. If it's still not seen on a transvaginal ultrasound by 8 or 9 weeks, your doctor may reevaluate whether the dating of the pregnancy is accurate. She may also order blood work to see where your hCG levels and progesterone levels are. In some cases, no heartbeat seen at 9 weeks indicates a missed miscarriage. As always, ask your doctor if you’re concerned. Detecting a fetal heartbeat with a Doppler device is considered a clinical sign of pregnancy. A fetal heartbeat is significantly faster than the mother’s heartbeat, and this is how your doctor knows it’s not your heart being picked up. Even though a fetus’ beating heart can be picked up transvaginally as early as 6.5 weeks, it takes longer for a Doppler device. Usually, your doctor will be able to detect a heartbeat around 10 to 12 weeks pregnancy. If your doctor doesn’t pick up the heartbeat at this time, don’t panic. Sometimes the position of the baby can make it difficult to pick up. It’s also possible the dating of the pregnancy is slightly off. If you have an at-home Doppler, you will likely not be able to pick up the heartbeat at 10 to 12 weeks. There is skill involved in finding the heartbeat. If you’re worried, contact your doctor. Also known as quickening, this used to be considered a clinical sign of pregnancy. Fetal movement is noticeable by the mother as early as 16 weeks and as late as 25 weeks. With today’s technology, fetal movements are rarely considered when diagnosing a pregnancy. Ultrasound (to see the fetus) and Doppler (to hear the heartbeat) can clinically verify a pregnancy earlier. What Does It Mean If Clinical Pregnancy Signs Are Late or Absent? Let's say you got a positive pregnancy test result, and your doctor orders an ultrasound. But then you don’t see what is expected. Maybe there's no discernible yolk sac or fetal heartbeat. Before you worry, there are some common causes for not seeing what is expected based on the dates you provided your doctor. The most common cause is you ovulated later than calculated. For example, based on your last menstrual period, your doctor may assume you’re six weeks pregnant when you’re really only four or five weeks pregnant. One week makes a big difference when looking for early clinical signs. If you had IVF treatment, however, getting the dates wrong isn’t possible. You may also know your exact conception date if you had a closely monitored non-IVF fertility treatment cycle. Another possible reason for not seeing clinical signs when expected is the position of your uterus or where the embryo has implanted, which can delay visualization. Lastly, the kind of ultrasound can change the dates of when you might expect to see something. A transvaginal ultrasound can visualize clinical pregnancy signs earlier than a trans-abdominal ultrasound. The skill of the ultrasound technician and the quality of the equipment can also affect what is seen when. Ask your doctor if you’re worried. Is a Chemical Pregnancy a Real Pregnancy? If by real pregnancy you mean an egg was fertilized by a sperm, yes! A chemical pregnancy is a real pregnancy. The truth is that a chemical pregnancy is as real as any other pregnancy. There were an egg and a sperm; they came together and created an embryo. Mourning that loss is normal and understandable. For doctors, defining these terms was never intended to label your loss as insignificant. Primarily, it’s a way of dating and defining the viability or progress of a pregnancy in research. Not the “emotional realness” of the pregnancy. Annan JJ1, Gudi A, Bhide P, Shah A, Homburg R. “Biochemical pregnancy during assisted conception: a little bit pregnant.” J Clin Med Res. 2013 Aug;5(4):269-74. doi: 10.4021/jocmr1008w. Alexandra Stanislavsky, Radswiki et al. Fetal Pole. Radiopaedia.org. Avni K P Skandhan, Frank Gaillard, et al. Yolk Sac. Radiopaedia.org. Concerns Regarding Early Fetal Development. American Pregnancy Association. Makrydimas G1, Sebire NJ, Lolis D, Vlassis N, Nicolaides KH. “Fetal loss following ultrasound diagnosis of a live fetus at 6-10 weeks of gestation.” Ultrasound Obstet Gynecol. 2003 Oct;22(4):368-72. Sinan Tan, MD, Mine Kanat Pektaş, MD and Halil Arslan, MD. “Sonographic Evaluation of the Yolk Sac.” Journal of Ultrasound in Medicine. JUM January 1, 2012, vol. 31 no. 1 87-95. Turandot Saul, MD, RDMS, and Resa Lewiss, MD, RDMS. “Focus On - Ultrasound Imaging in First Trimester Pregnancy.” ACEP News: July 2008.